I’ve been in the outfitting business since 1976. I learned how to paddle from my dad when I was about 9 years old. He learned from his dad (my grandpa)who moved to America from Slovenia in 1922. My dad showed me the only two strokes one really needs to use and the affect they have on the canoe. Back then, 40 years ago, we didn’t know the names of the strokes. We just knew what they did. So, he’d put me in the stern of a 17 foot Grumman square stern handed me one of the only few paddles we owned back then – it was big for me. 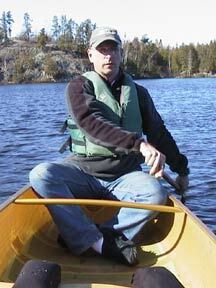 Then, from the front of the canoe he instructed me how to move the back of the canoe with a J Stroke and a Draw Stroke. He taught me how to line his body up (he was in the front of the canoe) with a distant tree or rock and watch how my J Stroke affected the direction of the canoe. I had been shooting BB guns since I was five and got my first .22 caliber semi-auto rifle when I turned nine, so lining him up with a target was a very easy thing to do. However, holding the canoe in position with my dad in the front and little me in the back was a bit more difficult, because in the wind with the stern of the canoe up in the air (heavy guy in front, light kid in back) the canoe wants to weather-vane into the wind all the time. As a result, it was easy for me to turn the canoe but a LOT harder to hold it straight in any position in anything other than directly into the wind. But after some tries and practice, I got the hang of it and developed an ability to “finesse” the canoe even when it was improperly loaded as it was with me in the back. As I got bigger, it got easier. And, over time I could hold any decent canoe (canoe with sensible rocker built into the hull) in a laser straight line or make it go in anywhere I wanted to go. One other thing my dad taught me was handling the canoe in the wind. Heading a canoe straight into the wind makes your life more difficult. It’s like walking a tightrope with the wind forces requiring you to balance between left and right. This constant balancing and correction will wear you out unnecessarily. Instead of paddling straight into the wind, if you are on open water and going a distance, angle against the wind slightly. Make the wind work for you. If you use the wind to lay up at a slight angle against the canoe the stern guy, won’t have to use as much of a J stroke. In fact, the stern guy could paddle with powerful straight-ahead strokes on the right side of the canoe which makes a normal canoe with a wind from the left bow side, try to turn into the wind. If you match the wind strength, no J stroke is needed and you’ll paddle in a straight line, slipping against the wind. If you exceed the wind’s strength, you will turn into the wind. If the wind is too strong, you will lose ground as the wind pushes you to the right and then completely broadside. At some point, you will need to change the canoe and your paddling sides to aim the canoe to the other way as you run out of water with the shore approaching. Just reverse the paddle positions and do the same wind-slipping thing. More or less, you are “tacking” which is how a sailboat sails into the wind. It’s a big, controlled, zigzag pattern down the lake. Notice the green bars: They indicate the position of the paddler as it is pulled by you through the water. Avoid paddling straight into the wind whenever possible. It’s like walking on a tightrope. Now sometimes, you can’t avoid paddling headlong into the wind especially if you are in a really narrow bay, so common sense must apply. Do this: Instead of going straight into the wind, use the wind to your advantage. Stern paddler paddles straight ahead and matches the strength of the wind that lays up against the other side of the canoe. 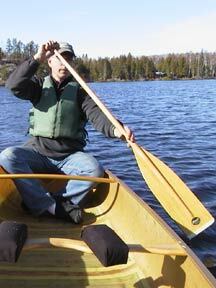 The stern paddler doesn’t (or may not) need a J stroke to hold a straight line depending on the strength of the wind. Bow paddler on the opposite side of stern paddler, paddles straight ahead as well. When you get close to the shore on the right side, switch canoes sides and paddling positions and “tack” with the wind on your right side. Just reverse your positions. To turn into the wind: If the wind is stronger, tell the bow paddler to switch to the non-wind side. Stern paddler then switches to the wind side and employs a J stroke with enough forward power and rudder (the “J” part) to match what is needed to turn the bow into the wind. The stern paddler uses the bow paddler as a “front sight” to see how much “j” is needed in each stroke to make the canoe either hold against the wind or turn into the wind. By having the bow paddler on the non-wind, right side (in the diagram above), a normal canoe’s natural tendency is to turn to the left. Add a stern paddler who is forcing the stern of the canoe to the right with the J stroke (in the diagram) and the canoe turns into the wind if the stroke is a hard J. You are seeing kind of a lazy “J” above which means the canoe will not turn too hard. You determine how hard the canoe needs to turn from the stern, so watching your paddle will tell you nothing. 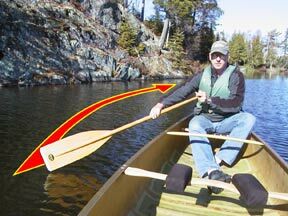 Watch the bow paddler and the shoreline to measure your effect on the canoe. If the wind is blowing hard on one side and you want to turn into the wind, have your bow paddler move to the non-wind side of the canoe and paddle straight ahead just as you see the little green paddle stroke postions above. This automatically puts canoe pressure against the wind because the canoe wants to turn opposite of the bow paddler’s stroke. 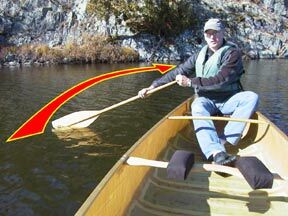 The stern paddler moves to the same side of the wind and uses a hard “J” stroke as indicated by green line at the stern of the canoe for your paddle position as you push it through the water. 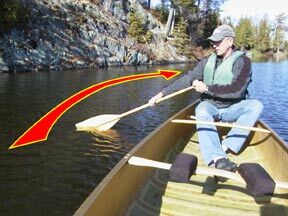 This “power-forward-then-fluid-rudder” J stroke pushes the back of the canoe to the opposite direction which forces the front of the canoe into the wind. Teamed up with the bow paddler naturally forcing the bow into the wind, you can efficiently make the canoe turn under your control without losing a lot of speed. If the wind is ridiculously strong do the next maneuver you’ll see below. This maneuver will work for repositioning a canoe. 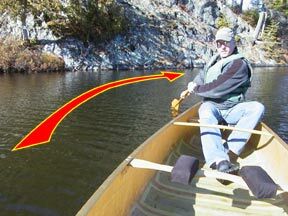 A normal canoe can be turned into a stiff wind with ease doing this maneuver. Note: at the risk of sounding like I’m picking on Wenonah, this is about the only way you can seriously turn a loaded down MN II and it will be difficult as well. The MN II is a rockerless racing hull – it only wants to go straight no matter what your do with your paddles. The next maneuver is an effective way to try to move the MN II beast even when not in a wind. For other canoes that are more suited to John Q Public who are not “elitest-minded” paddlers (Note: I didn’t say anything about “elitest ability” because I’ve witnessed many MN II owners who have very limited paddling abilities and shouldn’t even be in that hull design – I’ve been watching them for years, now – I’m so underwhelmed. ), these canoes will turn as they need to turn and this next maneuver will do a very bold reposition of the canoe in a really stiff wind. Basically, the bow paddler draws to the right and the stern paddler draws to the left (or vice versa) Follow the little green bars to see the paddle position of the complete stroke as it is pulled through the water. You pull the flat blade to you and turn the paddle and push back. This drags the canoe in the direction you want to go for the first part of the stroke and follows up with the power part of the stroke to propel you forward. It’s important to remember that propelling forward in a stiff wind keeps you from losing ground. If you stop going forward to just turn the canoe (which a common, easily-observed occurence with many paddlers in MN II’s and Spirit II’s), you MAY lose a LOT of already-paddled ground. So, draw to yourself, turn the paddle and then continue to push yourself (and the attached canoe) forward; in one fluid stroke. Practice the draw stroke. 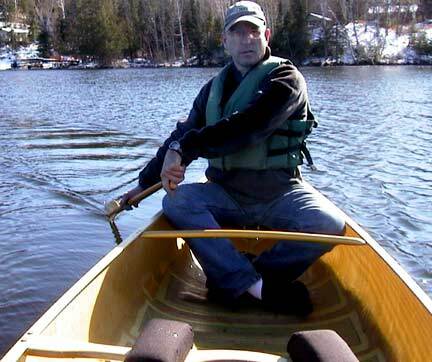 It’s easy and effective on both ends of the canoe. Your bow paddler, (regardless of gender) should know how to use a draw stroke. If there is ONE technical stroke they need to know, it is this one! You call to them is to ” DRAW LEFT” or DRAW RGHT” when YOU need it. When not using a draw stroke, the bow paddler just paddles forward normally. 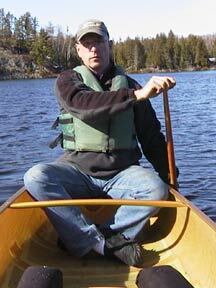 The guy in the stern is responsible for ALL steering of the canoe ALL the time. 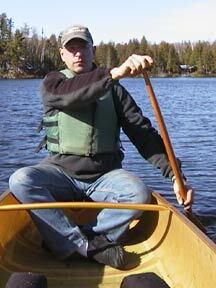 Be warned: I never want to hear how “the wife (or other bow paddler) didn’t paddle the bow of the canoe properly”. If this is said in my presence, I will embarrass and humiliate the stern paddler (who said this) into the ground and without mercy. And I don’t care how big you are… Repeat after me: The stern paddler is in charge of the directional control of the canoe, period.